Preheat oven to 375 degrees F. Line a baking pan (cookie sheet) with parchment paper. Melt butter in a 1-quart microwave safe container. Toss pecans in butter. Stir brown sugar and cinnamon together in small bowl. Stir into pecans, coating well. Turn pecans out onto prepared baking sheet, spreading evenly. Place in oven for 3-4 minutes until sugar is carmelized. Watch carefully before the end to prevent burning. Remove from oven and allow to cool on parchment paper. When cooled completely to room temperature, store in an airtight container. Yield: 1 cup, or approximately 8 servings. Yum! 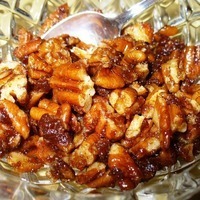 As a Texan with a pecan tree, I'm looking forward to making these for the holidays. It is such a simple but amazingly delicious recipe..